The world’s first ever helipad outdoor cinema makes its public debut today at Asia’s first and only green helipad bar Stratosphere, The Roof (First Avenue, Bandar Utama PJ). 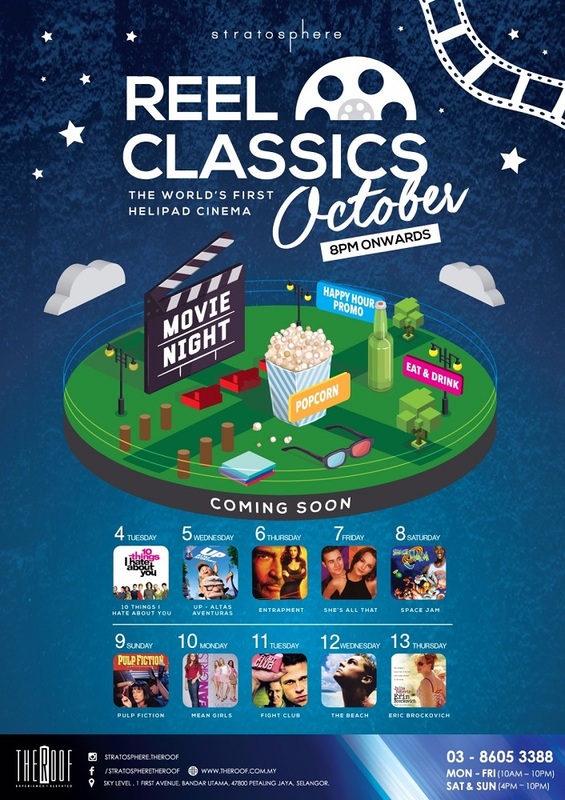 For a duration of only 10 days until 14 October, it will be screening classic films such as Fight Club, Pulp Fiction, Up, The Beach, Erin Brockovich, Space Jam, 10 Things I Hate About You, Mean Girls, She’s All That and Entrapment— hence “Reel Classics October”. 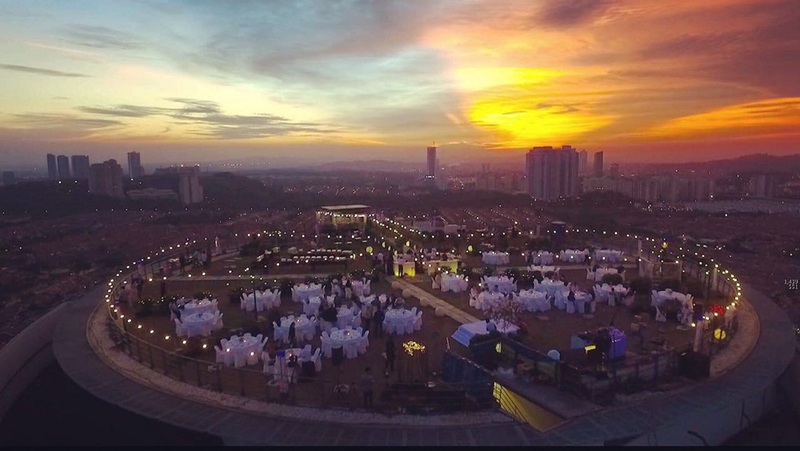 It’s a unique outdoor cinematic experience under the stars with a nice 360-degree panoramic view of the city and Klang Valley. Priced at RM45 per person, each ticket holder will receive complimentary popcorn and cocktail. Visitors will be provided with bean bags and quality wireless headphones (to hear the audio of the film being screened). Snacks and other alcoholic beverages are available at the helipad bar. Happy hour promotion for sunset cocktails are available from 6pm – 9pm at RM15 per glass. Option to Dine Under The Stars is also available if you haven’t had your meal before the movie. At the psychedelic 60s-themed media launch, General Manager of The Roof Carolyn Teh and founders of Piitch Limited Tim Hamilton and Callum Moon hosted an exclusive screening of Austin Powers: International Man of Mystery for invited guests and media. We got to revisit the hilarious spy parody classic while enjoying light canapes, popcorn, sunset cocktails, ice cold Kronenbourg 1664 Blanc, wonderful ambiance and the sky of that beautiful night. Although the screen wasn’t as big as I imagined it to be, the high definition visuals were sharp and I could hear the dialogues clearly even without the headphones. Watching the entire movie on the bean bag wasn’t very comfortable to me and my girlfriend’s view was partially blocked by the person seated in front of her but I believe you could sit at the tables or any where else you prefer. It’s truly quite a refreshing experience for movie-lovers like myself. 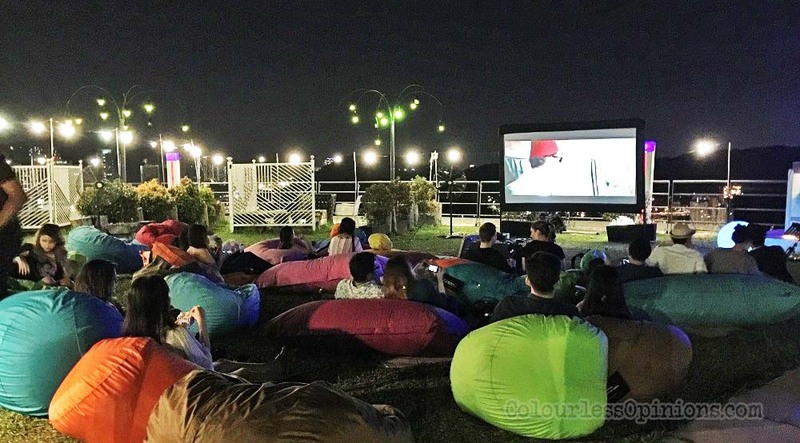 I mean come on, people, Pulp Fiction and Fight Club on a big screen in Malaysia screened on the helipad of a building with foods and beverages served? That’s freaking awesome! Tickets are selling fast due to overwhelming response so before it’s all gone and too late, I’d suggest you to book or purchase your tickets now at helipadcinema.com. There are two screenings a day — 8pm and 10pm. Arrive at least 15 minutes early as there will be no advertisements or movie trailers before the film. All films will be screened as scheduled rain or shine. If it rain, the movie may be paused for a little while before carrying on. Only in the case of extreme weather, only the screening will be cancelled.